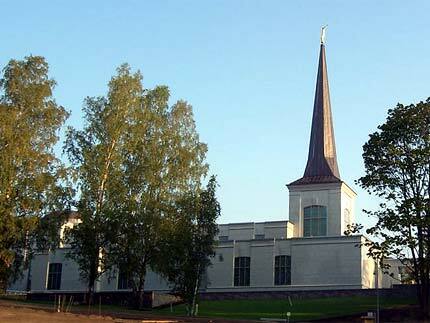 The Helsinki Finland Temple is the 124th temple of The Church of Jesus Christ of Latter-day Saints. The temple was first announced in the April 2000 General Conference. It is the third temple in the Nordic countries with the Stockholm Sweden Temple and the Copenhagen Denmark Temple being the previous two. Mormon Church Relations representative Seija Linnanen, who interacted with the workers on the temple, was quite impressed with the respect they showed in their language and attitude toward the Mormon temple. They refrained from smoking as well as listening to the radio, which seemed to convey that they understood and felt that the temple grounds warranted reverence and respect. The Church held a public open house for the Helsinki Finland Temple beginning on September 21, 2006 and ending on October 7, 2006. Those in the community were encouraged to attend and take the opportunity to learn more about the Mormon Church and the significance of temple to its members. The temple was dedicated by President Gordon B. Hinckley on Sunday, October 22, 2006. It was the last temple that President Gordon B. Hinckley dedicated. Following its dedication, the Helsinki Finland Temple serves approximately 26,000 members of the Church living in Finland, Estonia, Latvia, Lithuania, Belarus, and Russia. Geographically, the Helsinki Finland Temple district is the largest one in the LDS Church. This page was last edited on 19 December 2011, at 12:14.